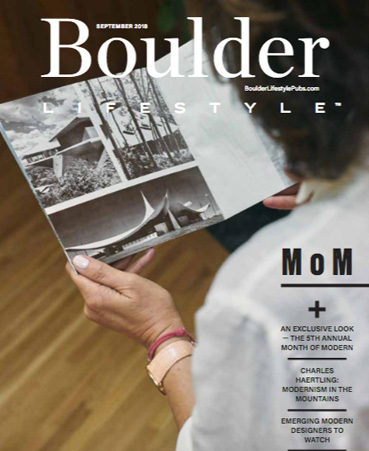 During the month of October, Boulder will be alive with Month of Modern 2015 (MoM), monthofmodern.com​. On the heels of a successful inaugural year in 2014, this year—presented by Jennifer Egbert Modern Luxury Real Estate—will once again lead the way in modern architecture, interiors, furnishings, art and culture, with an ​emphasis on sustainability, innovation and the evolution of design in Colorado. With so many people moving to the region from all corners of the world, the time is ripe to showcase the incredible design talent we have in our state​. MoM15 will ​integrate thought-provoking events, curated exhibitions and a Wrap Party/Award Ceremony​. We want to celebrate the businesses, organizations and individuals who ​elevate industry standards and drive the modern movement forward. MoM15 kicks off with an evening of enlightening talks with a twist.​ Ignite and Month of Modern are partnering up to “Imagine a Great City.” ​30 years ago Denver Mayor Pena was elected on a platform to “Imagine a Great City” of Denver. Today, it stands as an example of what happens when you dream big. With the pace of innovation today, what role does technology play in the future of design? Week 2 of MoM15 includes a panel discussion about responsible innovation. In a culture of planned obsolescence, what is our responsibility to improve upon ideas rather than always looking at the newest shiny object. Some of Colorado’s brightest design minds will talk about responsible innovation including car technology, building practices, home automation and furniture design. It’s time to unfurl a brand new fan of colors for 2016 with Sherwin Williams. And to add a little Colorado to the mix, we’re asking 6 design teams to pick the color they feel best represents the future of Boulder. Colors will be voted on throughout the month and the winner will be presented at The Wrap party. The Wrap party is truly an unforgettable night of design, local cuisine, craft cocktails and networking at the Boulder Museum of Contemporary Art. Bringing together the Front Range design community, we celebrate the region’s most acclaimed names in modern and contemporary design. Not to be missed, it’s the design event of the year in Boulder.